I added one more Golden Age Jack Kirby book to my collection. The Simon & Kirby Studio turned out a fair amount of romance comics for various publishers. One of their more successful titles was YOUNG ROMANCE and its spinoff YOUNG LOVE. 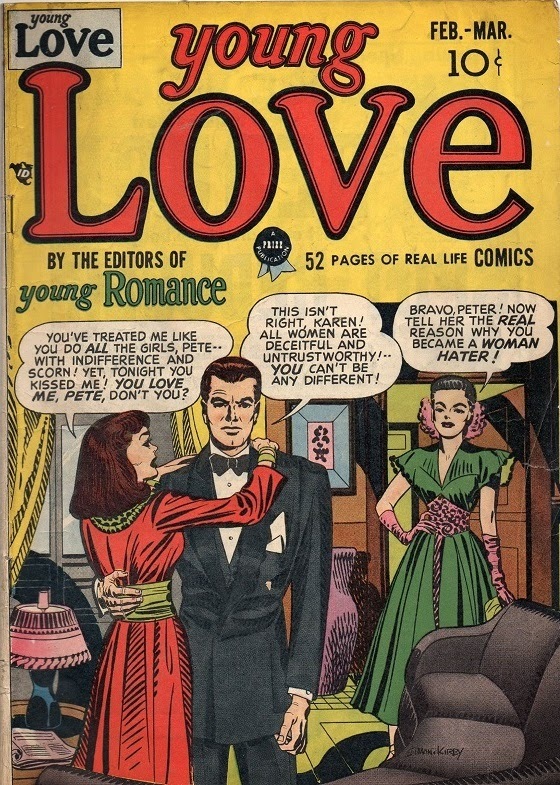 This is a copy of YOUNG LOVE #1, from 1949. Apparently the titles had some weird numbering systems and re-starts along the way. This is the #1 issue that appeared in 1949. The interiors have two Kirby stories which I’ll try to either photograph or scan later. A guy is running a series on YouTube pairing entire old Jack Kirby stories with music. You can experience rare Jack Kirby comics online–the entire comic with accompanying tunes. It’s amazing and needs to be seen. The time and effort he’s putting into these is impressive!